President Betsy Munroe called the meeting to order. Raffle: Judith McCaffrey brought a $50 gift certificate to one of a series of restaurants and tickets for two on a Double Dolphin sunset cruise. Joe Clark won. The club sang happy birthday to Betsy and presented red roses to her. 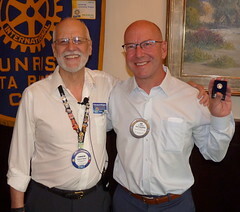 Visiting Rotarians: Hilton Morbin, Victor Morbin from Natal, Brazil. Hilton and Victor have both been exchange students in Pennsylvania. Hilton presented a banner from his club. Rotary Gala will be March 22. Our club will still be dark on Feb. 26. Sylvia, the first woman in Rotary, will be the keynote speaker. Betsy Munroe and Claude Saks inducted Kimberly Horn as a new member. Tom Putnam was her sponsor and Liz Alves will be her mentor. Welcome, Kimberly! Last night was the re-charter event of the Rotaract Club of Santa Barbara. They have more than 20 members. Many Sunrise club members attended the event at the Montecito Country Club, including Betsy Munroe, Bill Abel, Liz Alves, Dana Goba, Lucille Ramirez, Karen Kawaguchi, Scott Burns, and Janet Napier. 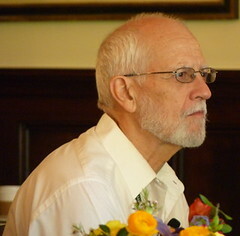 Joe Weiland, to complete his presidential year, awarded a Paul Harris Fellow +3 award to Dennis Johns. Janet Napier reported that they have cut the first check for this year to The Rotary Foundation — $6,300 — representing about half the club members. She will follow up with members who have not yet made their contribution. Susan Klein-Rothschild is still seeking volunteers for the dental clinic on February 7. Steve Kally invited all members and their friends to a group bike ride ending in Ojai on February 8. The starting place depends on how far you want to ride and/or walk. The full ride is on a bike path, not on roads. It’s very safe for riders of all ages. Don Bennett introduced Phil and David from the Salvation Army. They reported on the 2013 bell ringing in Santa Barbara. Major Phil Smith presented a letter of appreciation to President Betsy Munroe, thanking the club for its longstanding support and fundraising contributions. The club’s kettle has raised well over $19,000 in the past 9 years (although the club has been participating even longer). The Rotary Club of Santa Barbara Sunrise was again the grand champion. Lieutenant David Harth shared the totals: $311.69, $362.25, $438.28, $557.01 = $1,669.23 DT Rotary raised $1100.30. Getting to know you with Maurice Moreno. If you didn’t have the career you currently have, what would you be doing? He never thought about anything else. Perhaps an architect because he enjoys drawing and design. 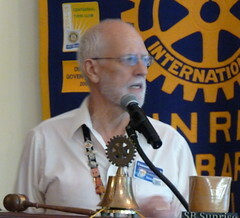 Graham Guess read the Rotary minute about The Rotary Foundation. He even gracefully executed the tongue twister. Andy Doerr said Brooke Sawyer and his wife Barbara would appreciate our prayers. The sailboat is somewhere between 46′ and 49′. It can fly 5 sails. Skills: Dennis learned how to open a coconut with a sharp stick. Crossing the Equator: He showed a photo of his GPS at 00 00 00, crossing the equator. He dressed up like Poseidon and drank and shared some with Poseidon. From Ecuador, they flew to Peru and explored Machu Pichu. The rain at the Galapagos made it extra interesting. They explored some lava tubes. Geology/Geography: He explained how a coral atoll forms. They visited several. In Tahiti, they found McBaguettes and Coca Cola. Boats need to check with air traffic control before leaving because the plans land so low and so close to the water that they could knock off your mast. They took a bicycle trip around one of the islands. They brought their own mountain bikes on the boat. They visited many schools. At one school, they had postcards from all over the world from people who have visited. Food: They ate a lot of papaya, mango and little tiny sweet red bananas. They were usually able to get the vegetables and fruits they wanted. Virginia maintained an excel spreadsheet on their food and supplies, and they generally kept a 40-day supply. They often had to change plans due to the winds. At the edge of a volcano, there was no railing or protection — just one sign saying danger, in French. At one point, the volcano spewed hot lava. The locals: At the most remote village they visited, some locals asked them to help charge the village’s DVD player because their generator had broken. He also gave them the 6th DVD in their collection, The Phantom of the Opera. They went to a 4-stage rock concert that was poorly attended because the locals couldn’t afford to attend. Rotary: They attended a couple of Rotary fundraisers on their travels, including one selling wine barrels in New Zealand and another selling booze in Darwin. They saw a couple of glaciers. Culture: They attended a performance at the Opera House in Sydney. And they saw many different cultural dances along their journey.